The traditional man-to-man defense is by far the most common defense in the game of basketball today. This is especially true as players progress to a higher level of competition. In fact, due to the great outside shooting of professional players, every NBA team almost exclusively plays man-to-man defense. The man-to-man defense involves all 5 defensive players on the court being allocated one opposition player who they’re accountable for defending whenever they’re on defense. Of course, there will be times when players switch opponents or help each other on defense, but for the most part, each player is responsible for one player from the opposition. Learning to be a great man-to-man defender is perhaps the most important skill for a player to learn during their years of youth basketball. No matter what defense a player goes on to play at the next level or on another team, the skills they learn playing man-to-man defense will transfer. Unfortunately, the same can’t be said for players that solely learn zone defense. If you’re coaching youth basketball, taking the time to teach your team man-to-man defense will go a long way to preparing them for the next level. 1. Every player needs to learn man-to-man defensive principles – It’s crucial that all youth players develop good man-to-man habits and understand man-to-man defensive principles. 2. Many Variations – There are many different ways to run your man-to-man defense depending on the team you’re playing against and what the strengths and weaknesses of your team are. 3. Preparation for future basketball – The better players get at man-to-man defense during their youth, the more opportunities they’ll get as they advance to higher levels of play. 1. There’s a lot to teach – Players will need to learn more defensive skills than if they were to play Pack Line defense or a zone defense. A lot of situations a player must know how to defend and where to position themselves. 2. It will take time for your players to successfully run – One of the most common reasons for youth coaches running a zone is that they don’t have enough time to teach a man-to-man defense. They’re right. There’s a lot to learn and it will take time. But it’s definitely worth it. 3. Unable to hide weak players – In the man-to-man defense, everyone is held accountable for their role defending the basketball and being able to help and rotate when needed. While I’ve listened to coaches name hundreds of rules associated with the man-to-man defense, there are only 5 key rules that you need to teach to your players. Not allowing the opponent to into the middle of the lane from the top or the wings is the most important rule of man-to-man defense. Instead, defensive players must use their stance and position themselves in such a way that the opposition can only dribble down the sideline and the baseline. 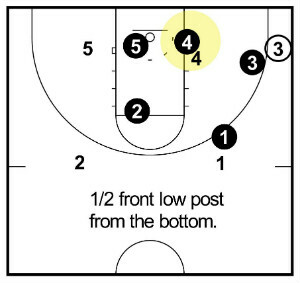 When an opposition player has the basketball at the top of the key, we direct them towards the sideline. When an opposition player has the basketball on the wing, we direct them towards the baseline. The reason we direct opponents towards the sideline and baseline is because it’s much easier to defend and rotate on a baseline drive than it is when a player drives into the middle of the lane. This is because the help defenders roles and responsibilities are clear in regards to who is meant to help and rotate when the basketball is on the wings or in the corners. When the basketball is driven into the middle, however, who is meant to help and who is meant to stay on their player becomes difficult to define which often leads to open scoring opportunities for the opposition. How many times have you heard a coach scream out “Reverse the basketball!” to their players? A lot, I bet. Perhaps you’ve even done it yourself. There’s a good reason for it if you have… it works for the offensive team! The more you can get the defensive team to move and rotate, the more gaps will open up in the defense and the number of open scoring opportunities will rise. So when you’re playing man-to-man defense, once the basketball has been passed to one side of the floor, we never want to allow it reverse back to the top or the opposite side. The players defending the ball-reversal should be in 100% deny the entire time. This is the biggest difference between the Pack Line defense and the man-to-man defense. In the Pack Line defense (which I often recommend), the players one-pass away from the basketball are helping in the driving lanes by taking away dribble penetration. This allows the basketball to be passed around the perimeter. In man-to-man defense, since the players one-pass away from the basketball are denying the pass to their player, this leaves driving lanes open and means the on-ball defender is more accountable for keeping the player with the basketball out of the lane. If an opposition player does attempt to drive down the middle, the player one pass away can quickly ‘stunt’ in their direction to get the offensive player to pick up the dribble, but they can never fully help. If they do, it will often lead to an in-rhythm jumper or an offensive drive after a difficult closeout. A defensive player must never allow their opponent to cut across their face in-between them and the basketball. The ‘no face cuts’ rule will most commonly occur when the offense performs a ‘pass-and-cut’. When an offensive player makes a pass to a teammate (they will still happen even if we’re denying them), the player defending the passer must immediately ‘jump to the basketball’ to force their opponent to cut behind them instead of in front. This rule is also important when playing defense off the ball to stop players from flashing to the ball to receive a pass. To put it simply, a defender must always stay between their man and the basketball whenever they’re playing off-ball defense. The final rule is to ensure that players are playing correct off-ball defense. Whenever the basketball moves, every defensive player on the court should be adjusting their positioning on the court. By keeping the importance of this in mind, players will learn that they must stay alert at all times and anticipate passes that they may be able to deflect. This is incredibly important because the difference between a steal and an open layup or a missed steal and a break down of the defense can be a fraction of a second. In this section I’m going to talk about each of them in detail and what’s required of a player when they’re in each role. Each player understanding all of these roles is crucial to good team defense. Being out of position by even a small amount can be the difference between blocking a shot or giving up an easy layup. The role of the on-ball defender in a man-to-man defense is to contain the offensive player while influencing them towards the sideline and baseline. While containment is the ultimate goal regardless of where the ball is on the floor, if the defensive player is going to get beat, we want it to be towards the baseline instead of the middle. This is why the on-ball defender slightly overplays the middle. It’s imperative that all defenders on the court have the ability to contain their man consistently. If not, dribble penetration will break down your defense very quickly. In fact, I never encourage on-ball defenders to reach in for steals unless the offensive player mishandles the basketball. There’s a far higher chance of them getting called for a foul than getting a steal. 1. Desire to be a great defender. The biggest differentiator between a great defender and an average defender is that a great defender wants to be a great defender. All coaches must emphasize the importance of learning how to be a great defender and the benefits your players will get from the skill as they progress to a higher level of competition. A player who desires to be a great defender is willing to stay down in a stance the entire possession, chase their opponent around the court, dive on any loose basketball to gain possession, take a charge if they’re in the proper position, etc. 2. Stay in a balanced stance. An on-ball defender must stay in a balanced stance at all times so that they’re ready to react to the offensive player as quickly as possible. This means they should stay low, keep their chest up, and place an even amount of weight on each leg. 3. 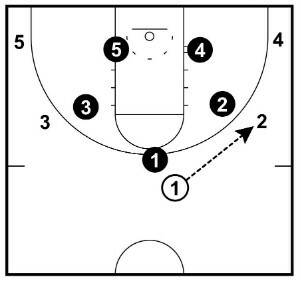 Slightly overplay the middle to force the offensive player sideline or baseline. The player defending on the basketball should have their head in line with the opponent’s shoulder on the side you don’t want them to drive. 4. Keep an arm’s length distance at all times. The defender should be able to stick out their arm full length in front of them and just be able to touch the player they’re defending. 5. Keep your eyes on the opponent’s chest. It’s very easy for an offensive player to fake with their head, eyes, or body. The spot on a player that is most difficult to fake with is their chest. As per rule #3, any player one-pass away from the basketball should be in a denial stance to deter any pass to their player. A denying defender should have one hand and one foot in the passing lane at all times, their chest should be facing their direct opponent, and they should be looking over their lead shoulder to see both the basketball and their man. This is important to note because I see far too many coaches teaching their players ‘ball-you-man’ stance when one-pass away. The reason this is the wrong stance is because if your opponent was to suddenly backdoor cut, the denial defender would need to do a full 180-degree turn to defend it. However, if your defender backdoor cuts when your chest is towards the player and you have a hand and leg in the passing lane, all it requires is the defender flicking their head around and the sliding in the deny position towards the rim. The purpose of this is that we want to remove all easy passing options from the player with the basketball. This is why the man-to-man defense is an aggressive defense. The distance a denial player should be from their man will depend on the distance the offensive player is away from the basketball. A good rule of thumb would be close enough to ensure you can close the distance and pick off the pass if a lob is thrown over the top. 1. One hand and foot in the passing lane. 2. Chest towards your direct opponent. 3. Eyes over lead shoulder to see both. Any defender two or more passes away from the basketball is playing help defense. This requires the defender to be in ‘ball-you-man’ stance. The ‘ball-you-man’ stance means that the defender is pointing one hand at their opponent and one hand at the basketball. They must be able to see both with their peripheral vision at all times. The position of a help defender will vary depending on where the basketball is on the court and where their direct opponent is on the court at that time. When the basketball is on the weak-side and below the free-throw line, the players two passes away will often be in either ‘High-I’ or ‘Low-I’. When the basketball is on either of the wings or in one of the corners, there should always be 2 help defenders with at least one foot on the split-line (the line down the middle of the court). 2. A help defender near the free-throw line (high-I). By establishing these two help defenders, it makes it much easier for the defensive players to know their understand their roles and rotations on drives to the rim by opposition players. 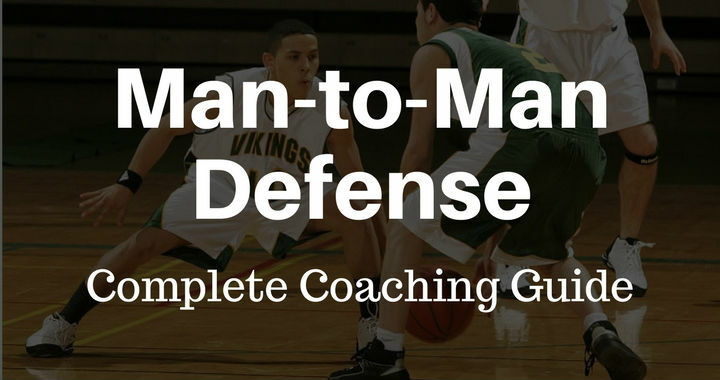 Now, let’s get into how your team will actually run the man-to-man defense during a game! First, I’ll talk about the positions the players should be in when the basketball is in different areas of the court. After that, I’ll break down what rotations must occur on the floor when there is dribble penetration from the offensive team. Whenever the basketball is within the lane lines at the top of the key, the team has one goal: Get it out of there! As soon as the basketball is dribbled over the half-court line, the point guard defender (x1) immediately starts forcing the dribbler to the sideline by angling their defensive stance. At the same time, the wing defenders (x2 and x3) pinch in and allow the pass to be made to a player on the wing. As for the help defenders (x4 and x5), both of them have a foot on their respective lane line. The goal when the ball is at the top is to get the basketball committed to one side of the court. This can happen either with the point guard dribbling to one side or passing to a player on the wing. When the basketball is at the top of the key, the man-to-man defense is at its most vulnerable. The reason for this is because on a drive through the middle of the lane, the defenders can be confused on who should help and who should stay attached to their player. The confusion will often lead to easy layups and open shots. This is because ball-side and weak-side has not been established. However, when the basketball is established on one side of the floor, players on the floor know whether they’re in help or deny and what their responsibilities are making help and rotations much quicker and easier. When the basketball gets to the wing, the most important thing is that you don’t allow the basketball to be reversed back to the top of the key. The player defending one pass away towards the top (x1) must be in complete denial position. The on-ball defender (x2) should be playing on the high foot of the player with the basketball to take away the middle drive and force them to drive towards the baseline if they choose to dribble. If the offensive player does attempt to dribble middle, the on-ball defender should only slide vertically to force them to the top of the key. As for the corner defender (x4), they should be in full denial as they’re one pass away from the basketball. Looking at the help defenders, x3 and x5 should have a foot on the split line as the basketball is at the free throw line extended or lower. This puts them in the best position to help, but still gives them time to recover and perhaps get a deflection if the players with the basketball decides to throw a skip pass. 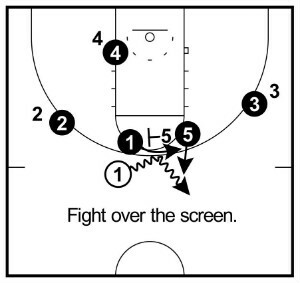 Once again, when the basketball is passed to the corner, the most important thing is that we don’t allow the basketball to be reversed to the wing. The player one pass away to the wing (x2) must be in complete denial and not allow the pass to be made to the wing. The on-ball defender (x4) must aim to contain the player in the corner. But by overplaying the high side, if x4 is beaten off the dribble, it must be towards the baseline because there is help waiting. 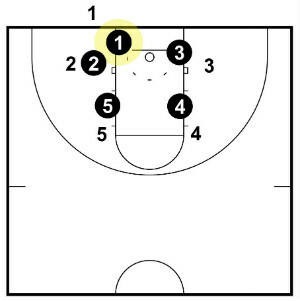 The player in low-I (x5) is in help position anticipating the drive from the player with the basketball. 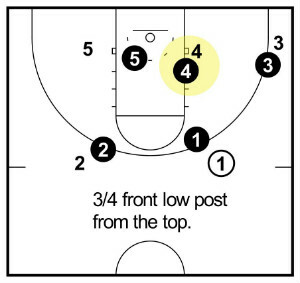 The player in high-I (x3) is in help position and is preparing to drop down and rotate if 4 drives the basketball and x5 needs to help. The final player (x1) is in ball-you-man position and are as low as possible while still being able to intercept a pass to 1. If your players aren’t able to make the correct rotations when an offensive players drives the basketball, you will have a very ineffective man-to-man defense. Make sure you constantly drill the following rotations each and every practice. As explained in the previous section, dribble penetration from the top of the key through the foul line is the hardest penetration to defend when playing man-to-man defense. We never want to let it happen. This can often occur against a great point guard, if the player defending the dribbler is playing too close to their man, or if we allow ball reversals and rotations and closeouts are poor. But knowing this will occasionally happen, your players must know how to best defend it. When the defender at the top of the key is beat and the dribbler gets into the lane, whichever defender is the lowest on the weak-side must step across to defend the basketball. X3 doesn’t help on the drive since they’re one pass away. They can quickly stunt to try to make the driver hesitate or pick up the basketball, but they must not leave their direct opponent. Since help always comes from the weak-side, x4 must step out and take away the corner three-point attempt. The player that must help is x5 since they’re the lowest on the weak-side. When x5 steps up to help, x1 must immediately rotate down and will now be the player that closes out on the basketball if the pass is made across court to 3 or 5. When the basketball is on the wing our ball-side and weak-side are clearly established which is great for the defense. On the baseline drive from the wing, if there’s an offensive and defensive player in the corner (x4), they do not help off a ball-side corner player. Remember: Help always comes from the weak side. 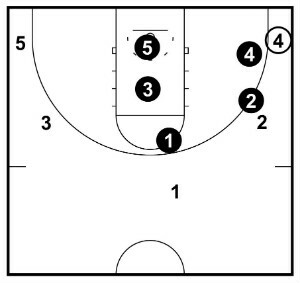 The player at the top of the key (x1) is denying the ball reversal. Then since the basketball is on the free-throw line or lower, we have high-I and low-I established in the key. 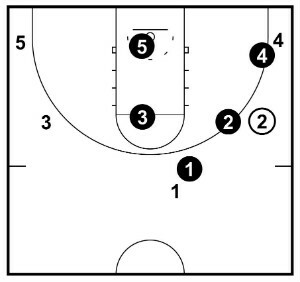 Low-I (x5) helps on the drive and meets to trap the dribbler just outside the paint. X5 and x2 trap the offensive player if they pick up the dribble. 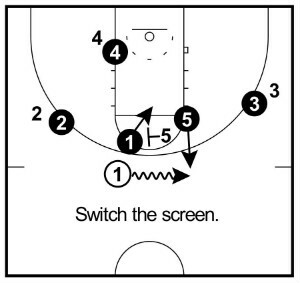 High-I (x3) must rotate down and prevent the pass to 5 in the corner. The final defender (x1) drops down and positions themselves so that they can intercept a lob pass made to either 3 or 1 or defend either of them if the skip pass is made over the top. The middle drive from the wing is a bit more difficult and not a drive the defense ever wants to give up. If the on-ball defender is correctly playing on the high side of the player with the basketball, they should be able to take a large slide or two vertically and cut off the drive or draw a charge. If the on-ball defender has been caught out of position, the next goal is to force the offensive player to dribble to the top of the key. If the on-ball defender has really been caught out of position and the drive is inevitable, the lowest weakside player must step across and challenge the shot and the correct rotations must take place. X3 can quickly stunt on this drive with their back to the basketball in an attempt to make the offensive pick up the ball as long as they can quickly close out on their player without giving up the shot. They should never fully commit to a trap as it will leave the wing shooter open. This can be a difficult rotation as if the dribbler crosses over the split line with their dribble, the help defender (ball-side and weak-side) changes. As you can see, allowing the middle drive ends up very problematic and confusing for the defense. So make sure it never happens! The rotations on baseline penetration from the corner are very similar to wing penetration. The defender playing on the wing player (x2) makes sure to deny the easy reverse pass back outside. The player in low-I (x5) is responsible for stepping across to set a trap with x4 if the player with the basketball decides to drive baseline to the basket. If this occurs, x3 drops down and cuts off the passing lane to the player x5 was defending. Finally, x1 drops and now has two offensive players they must position themselves in-between. If the interception pass is there, go for it. If not and the skip pass is made, x1 is responsible for closing out on either 1 or 3. Dribble penetration from the corner or wing, while there’s an offensive player in the low post, isn’t common but can happen. Since we 1/2 front on the low side when there’s a player in the low post, it’s easier for the low post defender (x5) to take one step across and trap the dribbler on the baseline with the on-ball defender (x4). To take away the pocket pass to the low post player, the defender in low-I (x3) must step across and guard the pass to the low post player. The defender in high-I (x1) must then drop and they’re responsible being in position to either intercept a lob pass or closeout on either 1 or 3. To not give 4 an easy pass out of the trap, x2 must continue complete denial of the outlet pass to 2. When there are offensive and defensive players in the high post, the defender does not help out on the drive as they’re too far away and all it takes is a pocket pass for an open jumper. Instead, low-I (x3) steps across as traps the dribbler with the on-ball defender (x4) just below the low block. The defender in the high post (x5), denies the pass to the high post player and doesn’t help. The player denying the retreat pass (x2) continues to deny the pass outside. This leaves high-I (x1) to drop in and is now responsible for intercepting the pass or closing out on 3 or 1. On any skip pass, the most important thing is that the player closing out on the player who receives the basketball closes out in a banana cut so that there’s no middle penetration. Every player on the team must be committed to sprinting to their next position on the flight of the basketball. Often it’s not the closeout player who is too slow, it’s the players who were previously on the ball-side not sprinting into help positions quick enough. Also, depending on what level you’re playing, you might want to run the shooter off the three-point line if they’re a good shooter. Top to Wing Pass – Should you allow it? In the guide above, I break down the variation allowing the pass from the top of the key to the wing because I believe it to be the most effective way to play man-to-man defense. Since the man-to-man defense is most vulnerable from the top, why would we want to keep the ball there by denying the pass to the wing? Is it easier to simply make a denying one pass away a universal rule including from the top? 1. Players can sometimes get confused when exactly they should allow the pass and when they should deny. 2. It’s another rule for players to remember. 3. Sometimes putting more pressure on the point guard is a good thing! 4. Most teams begin their offense with a top to wing pass. By denying it, you will often disrupt the opponents offense. Since there is no right or wrong answer to choosing to deny or allow the pass, each coach must decide individually after looking at the pros and cons. 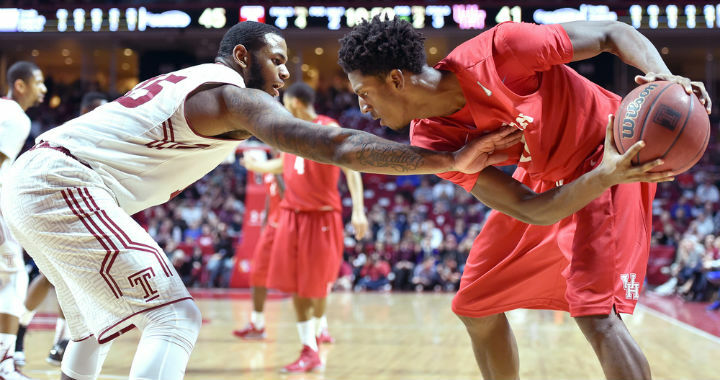 Knowing how your team is going to defend the post is crucial to a great man-to-man defense. You must have a consistent system that’s based on the strengths and weaknesses of the post players on your team. Don’t let it get there! Allowing the basketball to get into the post is bad news for any defense. It will often lead to part of the defense collapsing or a silly foul by a post defender. By beating the opposition post player down the floor, it takes away their ability to establish strong early position that can result in a quick pass inside and an easy score. Guards pressuring the player with the basketball can go a long way to discouraging the pass inside to the post player. Every on-ball defender should be active with their hands in the passing lane and tracing the ball. If a post player does establish position on the block, a post defender can move them further out by keeping their arm bar locked still while pushing the offensive player out with the strength of their lower body. 1. Basketball above the free-throw line. When the basketball is above the free-throw line, the post defender should 3/4 front keeping themselves on the line between the basketball and their opponent. 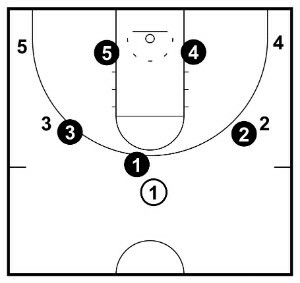 For the offensive team to make this entry pass, it would have to be very accurate and the post defender will still have time to establish position between them and the basket. Also, keep in mind that there is a player in low-I who can pick off any passes made over the top. 2. Basketball below the free-throw line. When the basketball is below the free-throw line, the post defender should 1/2 front from the baseline side. By doing so, they’re in perfect position to help on any baseline drives. Also, since the pass is now shorter, only half fronting the offensive player will allow the defender to still be able to establish position behind if they’re unable to get a deflection on the pass inside. There will be times when you come up against such a dominant low post player that you have no choice but to send help and trap them in the post. When this happens, I recommend sending trapping with the player in the low-I help position. 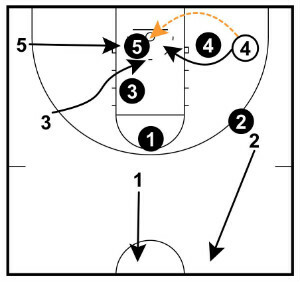 When 4 receives the pass in the post, x4 must immediately establish position behind. Immediately, x5 will sprint across and set a trap on the high side with x4. X2 drops to defend 5 and then x1 drops and becomes the interceptor. Their role is to pick off any passes made to 1 or 2. If none are available for steal or deflection, they’re the first to close out to whoever receives the outlet pass. On the ball-side, x3 never allows the simple pass out and is in complete denial while the basketball is in the post. You can never have a great man-to-man defensive team if you’re not a great transition defense team. Educate your players on the importance of this and then get them to buy-in and commit to transitioning back quickly after each offensive possession. The secret to being a great transition defense team is that your players must know how many people are going to the offensive boards and how many people are to immediately retreat on any shot attempt. The worst possible thing a player can do after an offensive shot is to stand and watch. Neither transitioning back on defense or attacking the offensive glass. Most coaches refer to this as being in ‘no man’s land’. A place a player never wants to be! 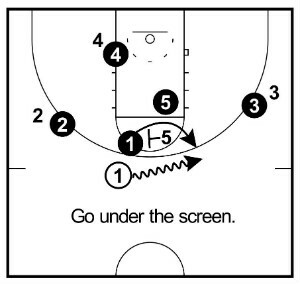 Send three players to the offensive glass and send two players back on transition defense immediately after the shot. As the two players transition back, the goal is to establish a top defender and a bottom defender. The bottom defender protects the rim while the goal of the top defender is to slow down the basketball and give the players that were competing for offensive rebounds time to recover on defense. This is the method I’ve found the most success with, but it might not necessarily be the best option for your team. For instance, if you have a very small team that never gets offensive rebounds, you could send all 5 players back immediately after each shot in an effort to never give up any transition baskets. There are numerous NCAA teams that currently do this. Inbounds plays often provide great scoring opportunities for the offensive team. They have well-thought-out plays and are in the perfect position to run them. The main goal when defending a baseline in-bounds plays is to get the opponent to throw the ball to the top and set up their main offense. If you can do that, you’ve successfully defended the BLOB. If you’re going to stick to the man-to-man defense on baseline inbounds, there are a few things you must be prepared to do to stop the opponent from getting an easy score. The main goal here is to take away the easy pass and score under the rim and force the opponent to pass out to the wing. Depending on where the in-bounds pass takes place, the in-bounds passer’s defender should position themselves along the lane line connecting to the baseline to take away the under the rim pass. Since the up-screens and cross-screens can be difficult to defend on BLOB plays, I often recommend that teams switch everything. The key is for defenders to stay below the offensive players and keep themselves on the basket side of their opponents. Depending on the level of basketball you’re coaching and the rules of your league, you might consider running a 2-3 zone on inbounds plays. Once the play has been in-bounded to either the wing or the top, players switch straight back into their man-to-man defense. The reasons the 2-3 zone works so well on BLOB’s is because it floods the key with defenders and doesn’t allow the easy baskets under the rim that can often occur when playing man-to-man defense. The pick-and-roll is arguably the toughest action in basketball to defend against. This is my recommended method of defending against the pick-and-roll. This requires the screener’s defender ‘hedging’ out high and forcing the dribbler to take a few extra vertical steps which allows the on-ball defender to fight over the screen and recover back in front. This can be difficult for youth players, but hedging and fighting over screens are great habits for players to get into at a young age as it will be a very important skill when they’re older. Another option a coach has at their disposal is to switch on any pick-and-roll. As the name implies, this simply means that the defenders hold their positions and swap the offensive player they’re guarding. This can be problematic if you end up with small player defending a big player or vice versa, but at the youth level players aren’t often smart enough to take advantage of it. To go under the screen, the screener’s defender can take a quick step back to give the on-ball defender room to squeeze past the screen and immediately establish position in front of the dribbler. While this is probably the easiest way to do it, I do believe players are missing out on the important skill of learning to fight over screens and how to hedge. 3. No help one pass away. 5. Move when the ball moves. The man-to-man defense is one of the best defenses you can run with your team no matter what level you’re coaching. With nearly all high-level basketball teams using this defense, the skills that are learned in man-to-man defense are crucial for all players to develop from the earliest age possible. Sure, it can be difficult to teach. But they payoff for your players will definitely be worth it in the long run. If you’re a coach that puts developing players over winning youth basketball games, then this defense is for you!